IDHS: DHS Document Management Solution is saving paper and money! DHS Document Management Solution is saving paper and money! The Illinois Department of Human Services (DHS) is saving millions of pieces of paper and as much as $250,000 yearly through an innovative Document Management Solution. DHS is one of Illinois' largest agencies, with more than 13,000 employees and an annual budget of over $5 billion. In 1997, Illinois merged several agencies together and created DHS to provide our state's residents with streamlined access to integrated services, especially those who are striving to move from welfare to work and economic independence, and others who face multiple challenges to self-sufficiency. Today, the department serves more than two million Illinoisans and, as you can imagine, that creates a lot of paperwork. Local offices operated by DHS have for some time had major issues with the production and storage of paper-based case files. 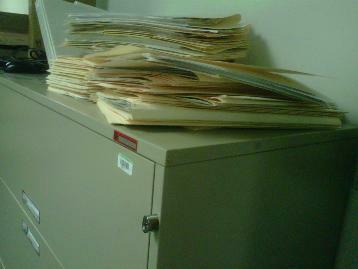 Often these case files can contain hundreds of pages and number into the thousands of cases within a single office. Compiling, maintaining and storing files have caused extreme space and security issues as well as resulted in less efficient services to customers. In 2010, the agency estimated that nearly 100 million pieces of paper were stored in manila folders, either at the local offices or warehouses throughout the state. The files took up space and the paper-based processes impeded caseworker focus on customers. Much of the paper produced, printed and maintained in paper-based case files was as a result of the required eligibility verification for programs such as the Supplemental Nutrition Assistance Program (SNAP), Temporary Assistance to Need Families (TANF) and Medicaid. Federal regulation and State rules required extensive verification and validation of many different eligibility criteria and mandate this information be maintained to document customer eligibility. The volume and retention periods for this information, along with the increasing caseload size within the DHS offices, continued to increase the costly production, storage and maintenance issues. The solution, as a first phase of the overall agency document management solution, was to develop a system in which the print stream for these documents could be captured, converted to electronic media (PDF) and ingested into a content management system using a predefined metadata set. Local office staff would then be able through a web interface, recall the documents for review and processing. In cooperation with IBM and Concurrent, DHS developed a system by which the print stream for the documents generated from the Concurrent system are captured and spooled through K Print. K Print identifies the target documents and directs the target documents to be converted to the Content Manager-based repository. Upon ingestion into the repository, an interface with Content Manger on Demand (CMOD) converts the print stream to PDF. The predefined metadata included on the PDF document is then read using the Content Manager (CM) interface and ingested into the document repository. No physical printing of the documents occurs. Staff then use a specialized CM Webi interface available on their desktop to retrieve the documents for review and processing. "We had to find a way to integrate the latest technology to capture metadata and store and manage electronic documents and enable ready access to PDFs of those documents on the caseworker desktops," said DHS Chief Information Officer Doug Kasamis. Today, approximately 2,000 caseworkers use the system. When a customer contacts the agency, a caseworker goes through a series of questions and inputs the responses into a dynamic Concurrent green-screen form Based on the information provided, the system determines program eligibility and automatically generates the appropriate forms. The resulting documentation can be anywhere from seven to 28 pages long. At this point, the Document Management solution efficiencies begin. The Concurrent system automatically sends out print streams, which previously went to a local office laser printer. Now, the streams are intercepted and sent through IBM® Content Manager software, which assigns metadata and stores the electronic forms in a central repository for later retrieval. Concurrently, IBM® Content Manager OnDemand software converts the form to PDF format. The resulting document is accessible on the case manager's desktop computer in near real time. Not having to print documents gives caseworkers more time to dedicate to customers. Many caseworkers do not have a printer near their desks. To complete case processing in the past, the caseworkers had to go to the nearest printer, make sure every page was there and printed correctly, come back and incorporate the forms into the case files. 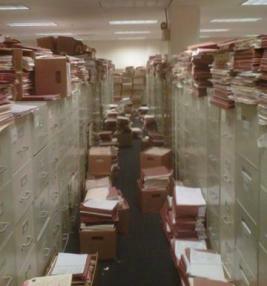 If those files were not at the caseworkers' desks, more time was lost searching the file room to find it. Now, after inputting new customer data, caseworkers pull up completed forms on their computer screens. Time spent retrieving case history documents have gone from minutes to seconds, improving both caseworker productivity and service to our clients. DHS has saved approximately 600,000 pages of printed material per month. Right now DHS is on track to save the state some seven million pieces of paper annually by digitizing three of 27 forms. In 2010, the cost for printing in local offices on small laser printers was more than $600,000 per month. The projected annual savings with Phase 1 of the new system exceeds $1 million in consumable printer supply costs. Once DHS fully deploys the IBM solution to include the remaining 24 forms, the agency expects that savings to grow to over 12 million pages annually. The system had a payback of 3 months. "I am proud that we have made a difference that improves productivity, serves people better, helps the environment, AND saves money!" DHS expects to digitize the remaining 24 forms in the next 18 months, helping enable a much more efficient workspace at local community offices. After eliminating paper at the front end, the agency will start retiring document file cabinets and warehouse space every year. From a records retention perspective, we have to store files for five years. Approximately 20 percent of our files are purged annually. Assuming at least 15 percent of that volume will not be replaced with new paper, DHS expects to be almost paperless within the local offices in a little over five years. This means major reductions in storage and filing costs and problems. Based on recent figures on lease costs per sq ft provided by CMS, current print volume fills approximately 24 five-drawer filing cabinets per day. 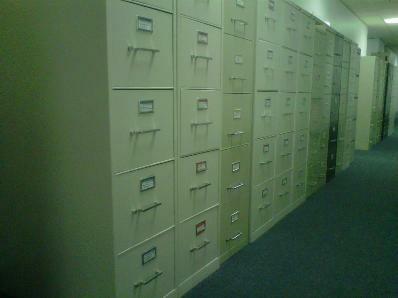 Floor space lease cost for these cabinets alone is more than USD750,000 annually. In addition, the agency expects to reclaim space and further reduce expenses by phasing out expensive-to-operate printers, copiers, faxes and scanners. When DHS staff members had to locate and search through paper files, gathering information for state and federal audits was arduous. Electronic records allow administrative staff members and caseworkers to quickly retrieve case files without undue disruption to normal work. In addition, purging records will be much easier. It will no longer be necessary to locate each physical case file and determine when each piece of paper in the file was produced. The Document Management solution streamlines document lifecycle management, with automatic alerts to approvers when a form is scheduled to be retired and immediate desktop access to the electronic copy. The Document Management Solution is just one of the many ways that DHS is being more efficient and effective with the resources we have.